As part of Sheikh Mohammed’s plan to transform Dubai into an open-air art museum, Dubai has signed an agreement with a master developer to improve areas of the city through art projects. Brand Dubai, the creative arm of the Government of Dubai Media Office, and Nakheel have signed a Memorandum of Understanding (MoU) to collaborate on city beautification projects. The MoU will support Brand Dubai’s #DubaiSpeakstoYou initiative, which will launch unique art projects aimed at enhancing the city. 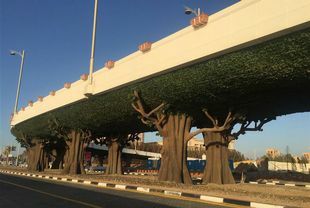 The first project has already been started at the East Crescent on Palm Jumeirah, where the pillars of the bridge have been decorated to look like tree trunks, with the underside of the bridge featuring installations of dense foliage. “The project forms part of our effort to install artworks that inspire innovation and encourage people to look at things in a new creative way,” said project manager Shaima Al Suwaidi.